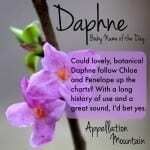 If Phoebe and Daphne are on the rise, why not this equally phabulous choice? Thanks to Mia and Nescharia for suggesting Phaedra as Name of the Day. Or so the story goes. Phaedra married the hero Theseus, and while they had a family together their happily-ever-after wasn’t quite what one would hope. Because when Phaedra met Theseus’ son Hippolytus, she fell head over heels. Some blame Aphrodite for meddling. Either way, the virtuous Hippolytus turned down his stepmom’s advances. A devastated Phaedra committed suicide, but only after leaving a note blaming Hippolytus for some very unchivalrous behavior. Theseus read the note, believed his wife and ordered the death of his own son. She’s not exactly a role model for your darling daughter. Still there’s much to admire in the name. The Greek phaidros means bright, lending Phaedra a straightforward and attractive meaning. (And making Phaidra an equally valid spelling, though far less common than the already rare Phaedra.) If you choose the FAY drah pronunciation, she picks up the popular “ay” sound of Kate and Faith. Should you stick with FYE drah or FEE drah, she lines up nicely with fashionable choices like Fiona and Felicity. There’s something undeniably creative about Phaedra, too. She’s oft-depicted in art. Her story has inspired writers from Euripides to Racine to Marina Tsvetaeva to Frank McGuiness. Factor in music and she’s inspired at least four operas. All this lends her an international appeal, too. In French, she’s Phèdre. In Italian and Spanish, Fedra. She’s not exactly a household name, but she won’t be unknown anywhere in Europe. And get this – Lee Hazelwood’s granddaughter? Her name is Phaedra. Phaedra has never appeared in the US Top 1000. And while her sound is simple, her spelling might be just a bit tricky for those who don’t recognize this one. Still, if you’re looking for a sophisticated name that can be considered an underused gem, Phaedra is certainly one to consider. My daughter is Phaedra Star. We get nothing but complements. We’re thinking about Phaedra as a name for our baby girl – it is rarely used even in Greece. There’s something powerful and hot about it. Unfortunately, there’s a “Real Housewives of Atlanta” housewife named Phaedra Park (UGGH) – we’re hoping she doesn’t get too popular. In any event, the only drawback is the tragic myth which just like any other Ancient Greek soap opera. The meaning of the name counteracts all the negativity of the myth, as far as I’m concerned. Wow, I would’ve never thought “ephedra,” and that’s after 16 years as an RN. That’s the OTC diet supplement that the FDA yanked off the shelves a few years ago; anyone with a legitimate use would refer to pseudoephedrine or maybe pseudofed/Sudafed. Bit of a stretch, I say. I really like Phaedra, along w/ Daphne, but Phoebe is by far my favorite. Sorry, I should have said appetite suppressant, not dietary supplement! I love the sound of Phaedra and suggested it once to a physical therapist, who quickly shot me down with “but that sounds too much like ephedra!” That’s what I get for suggesting it to someone in the medical field. FAY-drah, love it, love it, love it! I think Phaedra is such a nice little gem. She fits right into Kendra, which seems to have gotten trendy the last few years, maybe parents will see this as a fresher and less trendy alternative. I love that is can be shortened to Fae, and the name just has a lot of character to it. Darn it. I always forget to check the notify box. I know a girl named Phaedra. I asked if she had a Greek background, but she said her parents were hippies and named her after a song. I guess that was Nancy’s song? It’s an intereting name, and an interesting myth – and I wouldn’t use the name for a similar reason that I wouldnt use Ophelia or Medea. Just too much tragedy associated, I guess. I would definitely say FAY drah. I really like the “dra” ending sound on names but usually I don’t like the first part. My favorite is Audra. But Audrey and Aubrey are too popular and too close to make it useable for me right now. I like to hear and say Phaedra. I have a darling cousin Faye which would be confusing so it probably isn’t for me.